St. Philomena 291-304 Patron of: The Poor, Children, Babies, Priests, Lost Causes, Youth. Never official canonized, and listed in the local Calendar of Saints for only 130 years before being removed, Saint Philomena enjoys a unique and fervid following among common people, popes and saints. Her remains discovered seventeen centuries after her death, Saint Philomena is known as one of the great Wonder Workers of the nineteenth century and is the only person declared a saint based solely on their intercessionary powers. 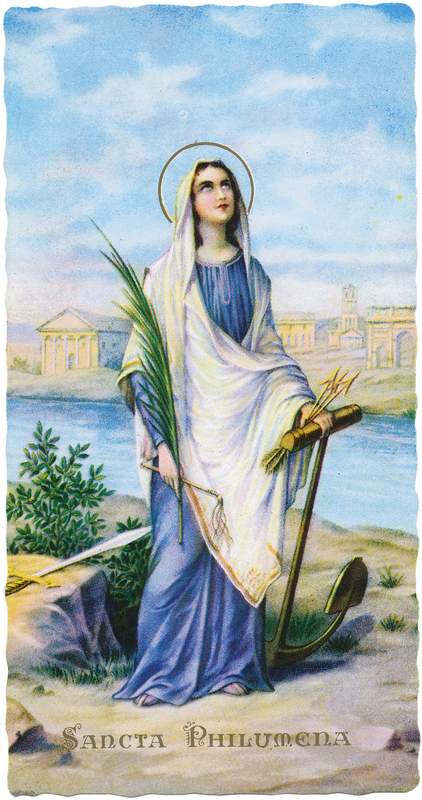 Recognized for her miraculous influence by six popes and ten different saints who have claimed personal experiences through her intervention, she is called upon when things look most hopeless. Discovered by a priest who hailed from a poverty-stricken parish near Naples, she is said to be particularly in tune with the needs of the poor. In 1802, the bones of a girl between the ages of 13 and 15 were discovered in the Catacombs of Priscilia in Rome, Italy. Three tiles closing off her space hollowed into the rock read, “Peace be with thee, Philomena”. Entombed with the girl was a vial thought to contain blood as well as drawings of a palm, two anchors and three arrows. Because these images were well known symbols used by early Christians to convey martyrdom, it was established that the girl was one of the many virgin martyrs in the early, underground church. In 1805 a young priest from the diocese of Nola (a district near Naples) requested the Vatican to allow him to obtain a relic for the new altar in the Church of Our Lady of Grace in Mugnano. Because he felt a spiritual affinity when he was near her remains, he was allowed to take the relics of the recently discovered virgin martyr back with him. Before her remains were translated to the church, they were put on display in Naples. Almost immediately, there were reports of miraculous healing. When her relics arrived in Mugnano on August 11, 1805, a cult rapidly grew, attributing many miracles to the intercession of the little martyr. In 1833 a Neapolitan nun, Sister Maria Luisa de Gesu, claimed to have a vision of Philomena who relayed her life story. According to her vision, Philomena was the daughter of the king of Corfu in Greece. When the Emperor Diocletian of Rome threatened her father’s kingdom with war, he traveled to Rome with his family in order to obtain peace. There Philomena discovered Christianity and vowed her virginity to Christ. When the Emperor saw how beautiful she was, he asked to marry her. When the young girl refused him, she was tortured and then drowned with an anchor tied around her neck. When two angels raised her up out of the sea, she was shot with arrows. After this failed to kill her, she was decapitated. According to the nun’s vision, Philomena declared that August 11th, the day her relics were installed in Mugnano, was also the anniversary of her death. In 1835, when Pauline Jaricot, the well-known and respected French reformer was gravely ill with heart disease, she made a pilgrimage to Mugnano and was completely cured by Philomena. News of this event spread throughout France and Spain and Philomena attracted such notable devotees as Saint Anthony Mary Claret from Spain and Saint John Vianney of France who built his own shrine to the little martyr. Several popes, while still cardinals paid visits to Philomena’s shrine. Pope Pius IX credits her with curing him of epilepsy. Saints such as Francis Xavier Cabrini, Padre Pio and Father Damian are numbered among her devotees. When the Calendar of Saints was reassessed to only list saints who had historical proof of their existence, Philomena lost her place. Her cult is still very strong and pilgrims from around the world visit her shrine in Mugnano. O Faithful Virgin and glorious martyr, St. Philomena, who works so many miracles on behalf of the poor and sorrowing, have pity on me. Thou knowest the multitude and diversity of my needs. Behold me at thy feet, full of misery, but full of hope. I entreat thy charity, O great Saint! Graciously hear me and obtain from God a favorable answer to the request which I now humbly lay before thee. I am firmly convinced that through thy merits, through the scorn, the sufferings and the death thou didst endure, united to the merits of the Passion and death of Jesus, thy Spouse, I shall obtain what I ask of thee, and in the joy of my heart I will bless God, who is admirable in His Saints. Amen. Saint Philomena, powerful with God, pray for us! Saint Philomena, powerful with God, hear our prayers! You can find St. Philomela and 35 other saints on novena app. This entry was posted in Love, Novena, Prayer, Saints by sandra dipasqua. Bookmark the permalink.